The red carpet premiere of "SHINE," in theaters Oct. 5, is coming up quick. On Oct. 2 the stars and filmmakers will walk the carpet along with special guests and Thisfunktional will be there. Who would like to join Thisfunktional at the premiere to watch the movie? 1 - pair of tickets to "SHINE" the Red Carpet Premiere on Tuesday, October 2 at Harmony Gold (7655 Sunset Blvd. Los Angeles, CA 90046) Red Carpet begins 6:30 p.m. / Screening starts at 7:30 p.m.
To enter you must be subscribed to my YouTube channel: Thisfunktional and follow instagram.com/Thisfunktional and email me your full name and mailing address with the subject line #ThisfunktionalContest #SHINEPremiere to Thisfunktional@Gmail.com. Disclaimer: Winners will be chosen randomly. Contest runs to October 8. 24, 2018 11:59 p.m. PST. No purchase necessary. Prize provided by Supersonix Media, inc.. Only open to the U.S., no PO Boxes or international addresses. Only one entry per household. Entries on behalf of another person will not be accepted and joint submissions are not allowed. We will not accept entries of contestants who have claimed a prize in the last 6 months. 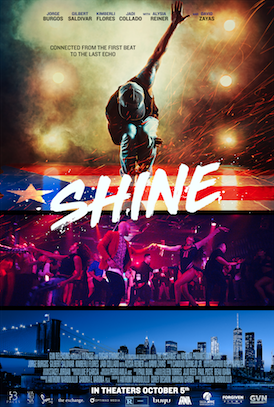 "SHINE" is a NY-set Salsa dance movie which tells the story of two Puerto Rican brothers, Ralphi Matas (Jorge Burgos) and Junior (Gilbert Saldivar), from New York's Spanish Harlem and the street's best Salsa dancers, are separated after a tragedy only to reunite years later on opposing sides of gentrification. After 7 years of absence from New York City, Ralphi is back to develop commercial real estate in his old neighborhood. However, upon his return, Ralphi encounters his estranged brother, Junior, who followedin his father's footsteps, Ramon Matas (David Zayas), and is now an elite salsa dancer and an unwavering activist AGAINST gentrification in the neighborhood. While having to face his past in order to succeed in the present, Ralphi must confront his boss Linda (Alysia Reiner) who is aggressively pursuing the lucrative development deal that brought him back to the city he was born, and thus is driving the wedge even further between him and his brother. On the other side, when Josie (Kimberli Flores), the new owner of their father's dance studio, reveals she is behind on the mortgage payments. Junior rallies the local dance community to raise funds against all odds to save the dance studio, DESPITE the gentrification efforts of his brother. While the brothers have chosen opposite paths thus far, they are brought back together when Tio Julio (Nelson Gonzales) reminds them of the power of family and the importance of their community. SHINE is a Forgiven Films movie, a division of GVN Releasing. Produced by 13 Paces in association with The Exchange, Sugar Studios LA, and Varona Productions.